Disclosure: This post may contain affiliate links. Items were received for review purposes. All opinions are my own. Welcome to the “Best of the Best Summer Giveaway”! This giveaway features some of the best products that have been featured on Karen’s Got Mail. I have teamed up with a great group of bloggers for this giveaway! Teach My has just launched in 2000 Walmart stores! Walmart is investing in Women-owned businesses! Me4Kidz – One Medipro First Aid Kit Pod (ARV $10.99). Each First Aid Pod includes 100 items to keep you prepared for your basic first aid needs. 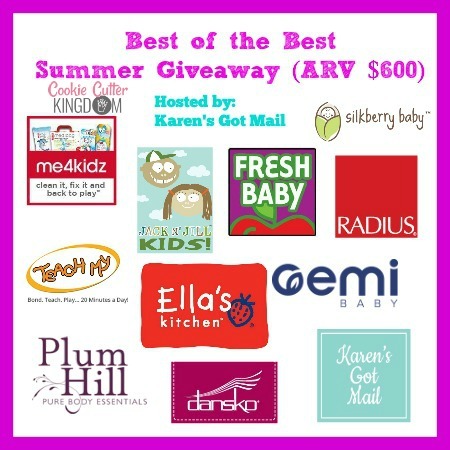 One lucky reader is going to win the Best of the Best Summer Giveaway Package valued over $600! Thank you so much for including my readers here at Tales From A Southern Mom, this is a great giveaway! This giveaway is open to the US only. Giveaway ends 6/26/15 at 11:59 PM EST. Enter using the Giveaway Tools form below. Good Luck! I am excited about the Oemi Baby Bag. I am most excited about the summertime cookie cutters!! My great-niece would look very cute in the Silkberry baby outfit. I am most excited about the Oemi bag. What a great giveaway! Thanks! I am most excited about the Oemi Bag. I’m excited for the learning box. I’m most excited about the Jack n’ Jill set. My son loves their toothpaste! I’ve wanted to try jack n jill toothpaste for a while now. I would love to win the Dansko sandals. I am excited about the Plum Hill body care products. I’m most excited about the Oemi Baby Bag. I am excited about the Dansko sandals.